Reprints Desk’s award-winning research platform Article Galaxy provides data-driven insights and one-click access to scientific, technical and medical (STM) content at the lowest legal cost, filtering against Open Access, subscriptions, publisher pay-per-view tokens and even full-text rentals. April, 18 2019 Sourcing Open Access Articles Is Easier Than You Think Article Galaxy, Reprints Desk’s research platform, integrates Open Access filters into document order forms by default. April, 4 2019 How to Obtain Peer ‑ Reviewed Articles Without Breaking the Bank The Document Delivery Gadget is an easy-to-use app that provides access to scientific documents on demand, you can easily access, purchase, or rent any scientific document, including Open Access and link-outs to publisher subscriptions. March, 14 2019 Introducing the Gadget Store - The Fastest Way to Improve Your Research More than 70 percent of the world’s life sciences companies rely on Reprints Desk’s Article Galaxy platform for easy literature access and discovery. The Gadget Store makes Article Galaxy’s research engine available to individual researchers and scientists, improving discovery and saving time. March, 12 2019 Get Ahead of the Curve: Scientific Literature Access Simplifed Get Ahead of the Curve: Scientific Literature Access Simplified. Visit us at Molecular Med TRICON 2019 and see for yourself why top life sciences companies rely on our award winning Article Galaxy platform to save time, reduce costs, and simplify access to scientific literature. February, 28 2019 Research at a Tipping Point? Have you noticed the news lately about the research publishing business? The Chronicle of Higher Education recently suggested we’re at a tipping point for scholarly publishing and goes on to mention libraries cancelling “Big Deal” subscription packages; Plan S to drive Open Access and the publisher pushback against it; researchers who remain frustrated by paywalls, (and even resorting to illegal means to access content). 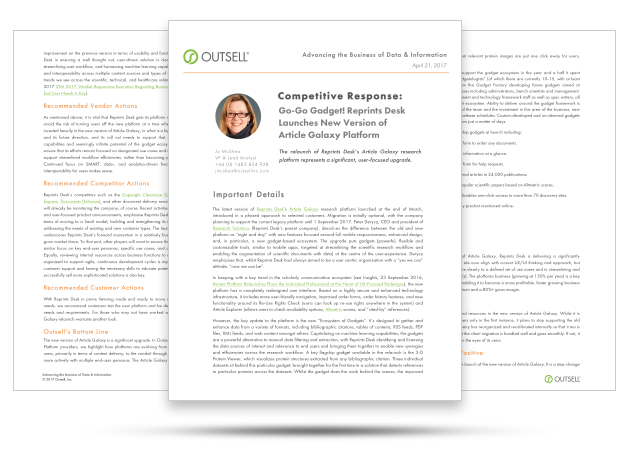 Download and read this report from research and advisory firm Outsell on Reprints Desk’s newest version of the Article Galaxy research platform.